“Standing nobleman with hat, facing right”, c1620–23, from the series of 12 plates, “La Noblesse” (aka “Gentlemen from Lorraine”), from a late 18th/early 19th century edition. Etching on wove paper trimmed unevenly close to the platemark and backed with a support sheet. 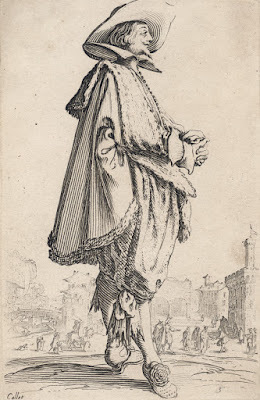 Lieure 1927 559 (J Lieure 1927, “Jacques Callot”, 3 vols, Paris, Editions de la Gazette des Beaux-Arts); Meaume 1860 670 (Édouard Meaume 1860, “Recherches sur la vie et les ouvrages de Jacques Callot”, 2 volumes, Paris). 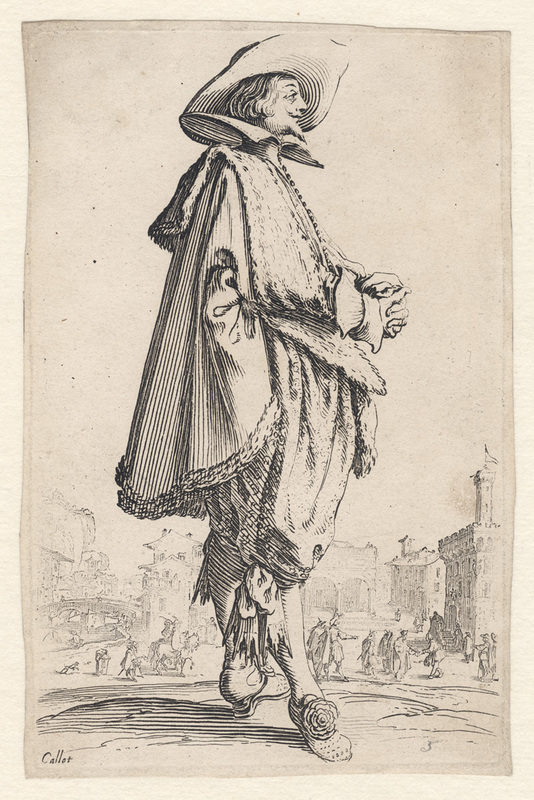 “Man standing in profile to right, with hands placed before his stomach; he wears a hat and a fur-trimmed cape; a square in a city in the background. Condition: crisp and well-printed impression, trimmed unevenly with thread margins and backed with a support sheet of archival (millennium quality) washi paper. The sheet is in excellent condition (i.e. there are no tears, holes, folds, abrasions, significant stains or foxing but there are minor signs of handling and age toning). 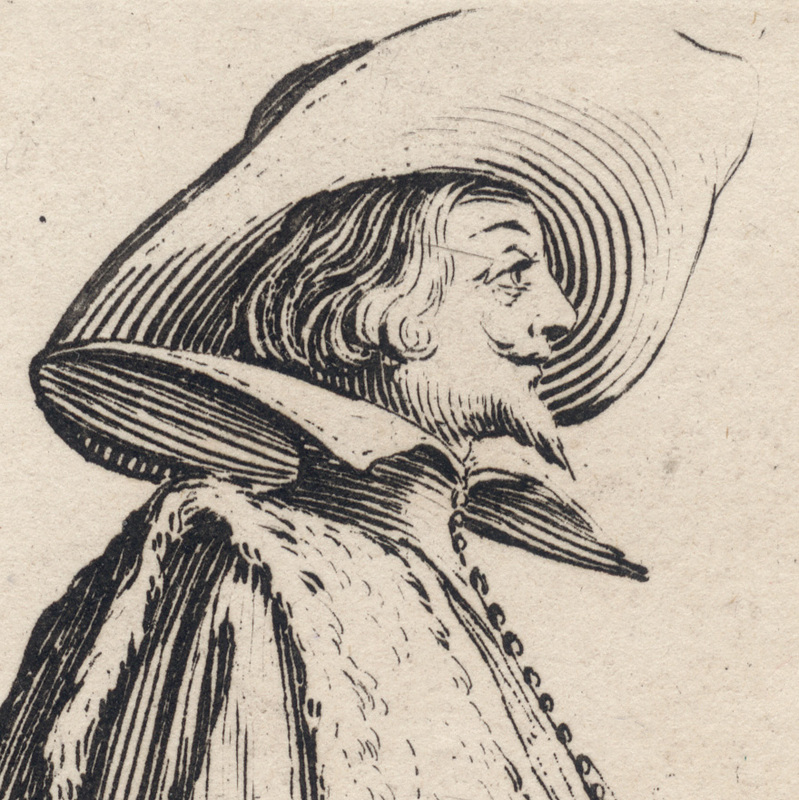 I am selling this wonderful example of a print executed with Callot’s famous etching needle that he developed, called the “échoppe”, which allowed etchers to make swelling lines like engravers—note in particular the shading lines on the gentleman’s hat—for AU$164 (currently US$123.94/EUR106.24/GBP93.20 at the time of posting this print) including postage and handling to anywhere in the world. If you are interested in purchasing this remarkable print, please contact me (oz_jim@printsandprinciples.com) and I will send you a PayPal invoice to make the payment easy. Last night when I planned to write a discussion about this etching of an elegant gentleman, I was so tired that by the time that I had donned my thinking cap and made sketchy notes about its attributes I fell off my chair asleep. Well ... it’s morning now and I’m presently waiting between flights on a long trip and I’ve decided to see whether my brain is going to help me with saying meaningful things about this print. I’d better begin this discussion by proposing that this etching is historically significant. In a quick moment of brainstorming I think that I’m correct as this print showcases at least three pivotally important attributes marking a change in the course of printmaking history. The first of these attributes is the swelling lines shaping the form of the gentleman’s hat. These lines are a perfect example of Callot’s use of the échoppe etching needle that he invented/developed. 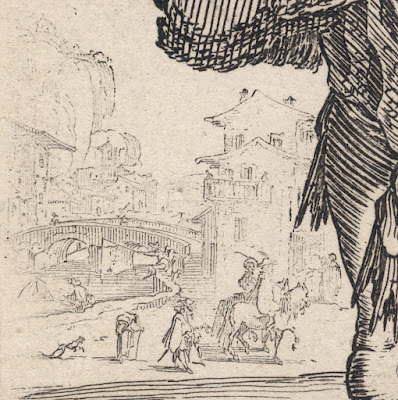 This tool allowed etchers for the first time to make the same type of lines with varied thickness as engravers. 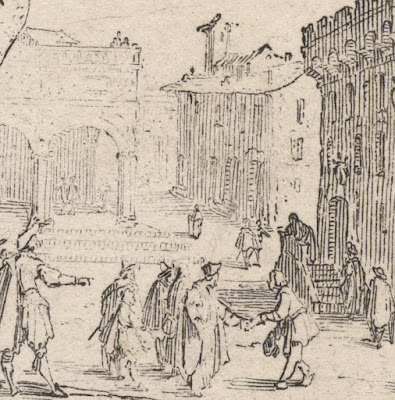 The second attribute marking this print as historically important is the difference in line quality separating the dark and emphatically strong lines depicting the noble from the light and delicately fine lines depicting the town square in the distance. 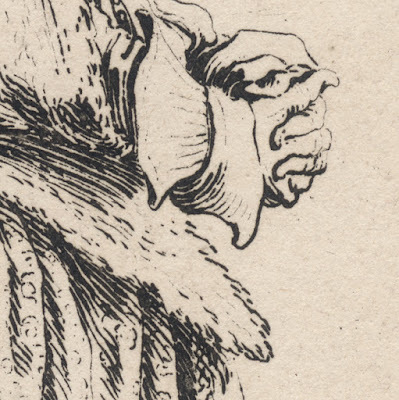 This separation of the two qualities of line was the outcome of another development in the art of etching by Callot: a refined technical process of “stopping out” areas on the printing plate during etching. 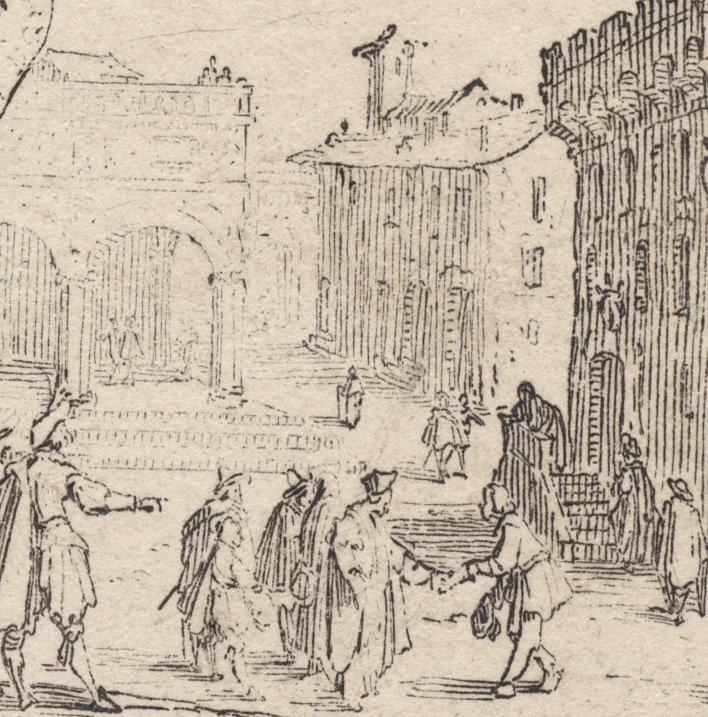 The third attribute is the cleanliness of the white spaces—the untouched/undrawn areas—of the print. 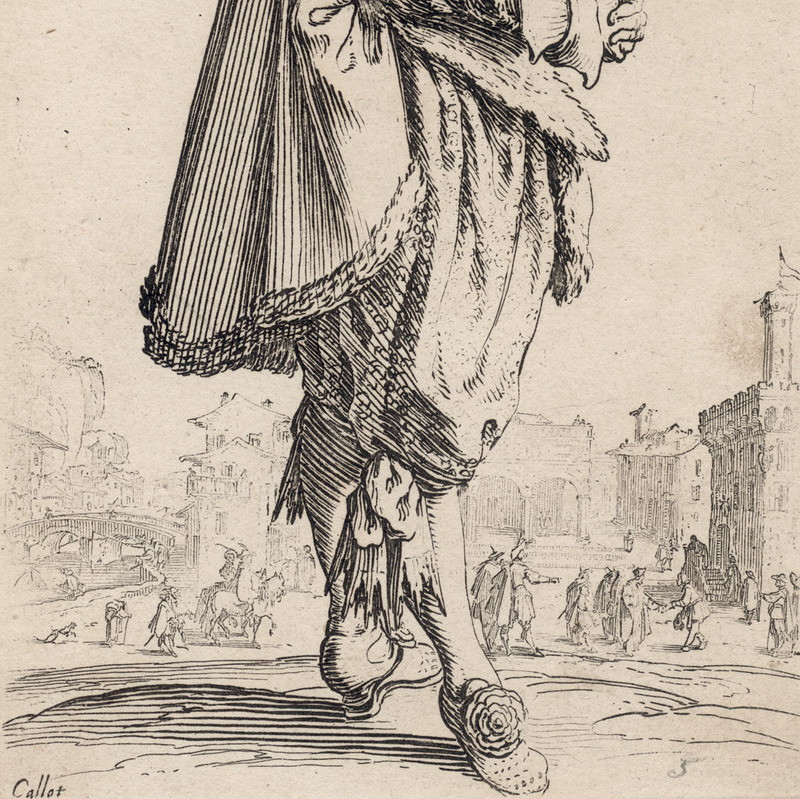 This quality may seem insignificant, but, in terms of the history of printmaking, it is amazing. 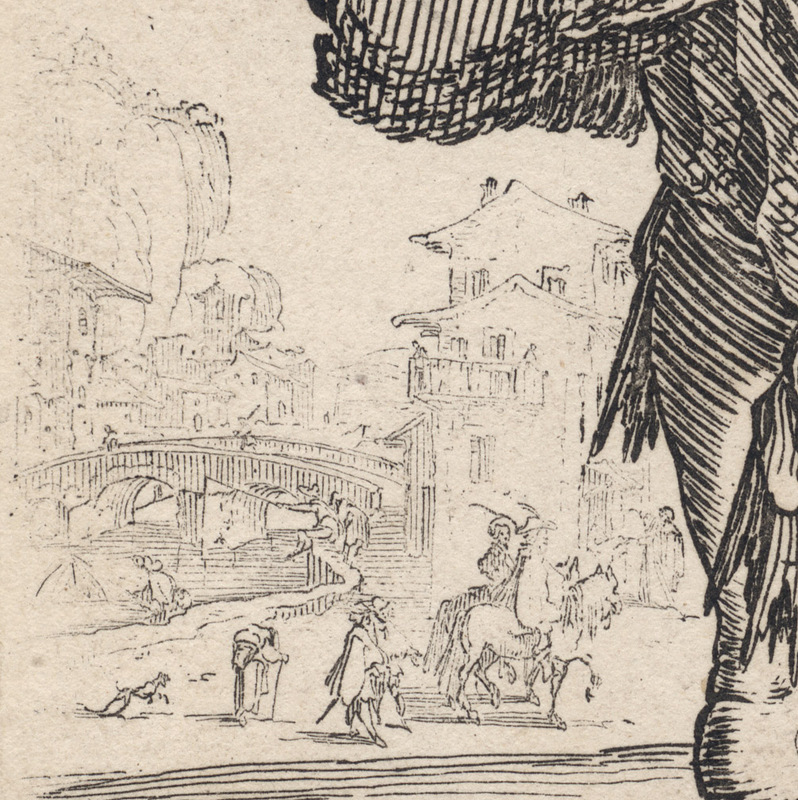 Callot was able to achieve this “cleanliness” by concocting a fresh formula for his etching ground. This new formula helped to overcome the areas of foul biting that were previously common in prints.